This month’s We Should Cocoa is all about coconut. As soon as Laura let on what the ingredient was going to be, I was mulling over some sort of bake using coconut oil, flour and sugar to make a really coconutty treat. I had something in mind, when I remembered seeing a coconut and ginger recipe in the booklet accompanying the Lékué cake pop kit I was sent to try out. As I was rather sceptical about cake pops and couldn’t really see the point of them, I hadn’t yet got around to doing anything with it. The time, it seemed, had come. The kit consisted of a round pink 18 hole cake pop tray made from platinum silicone and a decomax which is also made from platinum silicone. A recipe booklet is also included along with 20 plastic sticks. The cake pop tray has a base with a lid shaped to encourage the cakes to form perfect balls. The lid also doubles as a cake pop holder which can be used whilst the icing or chocolate coverings set. I didn’t actually use the decomax for this bake, but have used it to decorate my bundt cakes and mini chocolate cakes. As someone who hasn’t managed to get to grips with piping bags, I have been completely won over by it. Having said that, it comes with only 6 nozzles three round and three star shapes of different sizes. It would be good to have a bit more choice. It’s easy to fill, easy to use and is simple to wash. It can also be used to fill the cake pop holes, but in this case it seemed simpler to use a teaspoon for the task. Like the rest of the Lékué products I’ve tried out, the silicone is sturdy and of good quality. The only issue I had with this kit were the plastic sticks, which were really too feeble for the job and bent under the weight of the pops. The kit retails at around £30. So I adapted Lékué’s recipe, which sounded rather a good one. I used coconut oil rather than olive oil, substituted caster sugar with coconut sugar and used a mix of coconut flour and gluten free flour rather than wheat flour. These were going to be the only adaptations I made, but unfortunately, I started following the measurements from an adjacent recipe instead, so my quantities also ended up being different. Hey ho, never mind. Creamed 80g of softened coconut oil with 110g coconut sugar until well beaten. Beat in 1 duck egg (or use a large hen egg). Sifted in 135g flour (I used ⅓ coconut flour and ⅔ gluten free flour), 1½ tsp baking powder and 1 tsp ground ginger. Stirred in alternately with 4 tbsp Greek yogurt and 2 tbsp water. Added 35g shredded coconut and mixed until just combined. Spooned teaspoonfuls into the 18 hole Lékué silicone cake pop mould to fill up to the brim (it is suggested that the mixture is piped in, but as the mixture was quite stiff, it seemed easier to spoon it in). Covered the mould with the lid and baked at 180℃ for 16 minutes. Removed the lid, left to cool for a few minutes then turned them out onto a wire rack to cool completely. Melted 250g 65% dark chocolate (Inaya pur noir) in a pan over very low heat with 60g unsalted butter and 2 tbsp double cream. Inserted sticks into the cake pops and coated with the chocolate ganache. Placed the sticks in the handy holes on the lid and decorated with a little shredded coconut. Despite the myriad disasters I had whilst making these: wrong ingredients, cakes sliding down the stick, ganache being rather thick to work with and chocolate spreading itself over me and the kitchen, I was immensely pleased with my first ever cake pops. They tasted delicious and I finally saw the point of them. Eating little bits of cake covered in chocolate is a very different experience from eating a slice of cake with chocolate on the top. The higher ratio of chocolate to cake turned it into an intense and indulgent occasion. This was aided by the wonderfully complex notes of the 65% Inaya pur noir chocolate I used from Cacao Barry. I will also concede that the cake pops looked rather good too. I might add that these had a number of tasters and they all concurred with my assessment as they dug into their second cake pop. CT even managed a third. Click the link to find out what other chocolate and coconut recipes I’ve made. This is my entry to We Should Cocoa which is guest hosted this month by Laura of I’d Much Rather Bake Than …. Coconut is her ingredient of choice and with three types of coconut used, these cake pops are nothing if not coconutty. I didn’t manage to link up with The Spice Trail last month which was a shame as I was keen to try caraway in something other than my bread. However I have managed it this month as the chosen spice is ginger. Ginger is one of my favourite spices and we get through a lot of it in this household. This event is hosted by Vanesther of Bangers & Mash. This month’s Love Cake theme is giving up. Well I’m not a great fan of giving up, but this was fairly specific. We have to bake a cake or cakes without at least one of the standard ingredients, i.e. wheat flour, butter, sugar or eggs. I have managed to bake these pops without three of the ingredients, so feel I can be a little bit proud. This is hosted by Ness over at JibberJabberUK. The theme for this month’s Tea Time Treats is decorative cakes. Whilst my pictures may not show the more successful cake pops off to their best advantage, they really did look rather cute and definitely decorative. Hosted this month by Janie of The Hedge Combers, it is hosted alternately by Karen of Lavender and Lovage. Made from scratch as they are with lots of good for you ingredients, I’m sending these of to Javelin Warrior for his Made with Love Mondays. With their jaunty tops bobbing away on sticks and the yellow centres, I reckon these could pass off as Spring like, so I am entering them into Calendar Cakes hosted by Dolly Bakes where the theme this month is Spring Into Action. Thanks to Lékué for sending me the cake pop kit to try out and to Cacao Barry for the chocolate. I was not required to write positive reviews and as always all opinions are my own. Thanks Hannah. As I’ve never tried making these before, I have no idea what other contraptions there are out there, but this mould makes sense and seems to work. You wouldn’t want to eat one Jane – the chocolate has …. cream in it!!! They look lovely! I’ve never tried cake pops but really must. Mmmmm…ginger…. I’m sure you could come up with some fabulously coloured veggie ones Katherine. I’ve never really seen the point of cake pops either. But I love the combination of ingredients here…. makes them sound much more appealing! Haha, yes thank you Vohn. I’m not sure I could get much more coconut in there if I tried. I think you are right JW. This combination was a first for me too and a very good one it turned out to be. I love cake pops but I have only made them by rolling cake crumbs mixed in frosting – would try baking them in a cake pop set but the best thing about your cake pop kit is that it doubles as a holder. Haha, thanks Johanna. I know what you mean, I haven’t got used to it myself and am still taking a double look. I’ve made a cake crumbs and buttercream mix, coated them in chocolate and called them truffles. And they turned out heaps better than I expected. But these are definitely different. I love cake pops with every inch of my being! These look FANTASTIC! Wow, nice new look! It’s so different, there’s so much happening up there. Oh, and I am really envious of your whizzy cake pop maker thingy. That looks super fun! Thanks Lucy. I haven’t got used to it myself yet. Cake pops seem all the rage, so you’ll be lucky to escape a request for some. These would certainly be a treat for a party, worth the faff! You’re right Janice, these would be excellent for a party, but they are definitely a bit on the faffy side. Thanks Sylvia – I wouldn’t call them easy. Cake pops are really popular these days..these look so fun and delicious! They do seem to have taken over somewhat. I swore I’d never follow trends, but I guess one should never say never! Love that these are made with natural ingredients. I love cake pops but don’t want all the processed junk in them. Thanks April, I do try and use healthy ingredients as much as I can and rarely anything junky. Not made a cake pop for yonks but I have same mould to try out. Lovely photo! Look forward to hearing what you think about them Sarah. very pretty, my problem would be that if I made cake pops I’d eat them all in one go! What a picture you paint of yourself Fi! 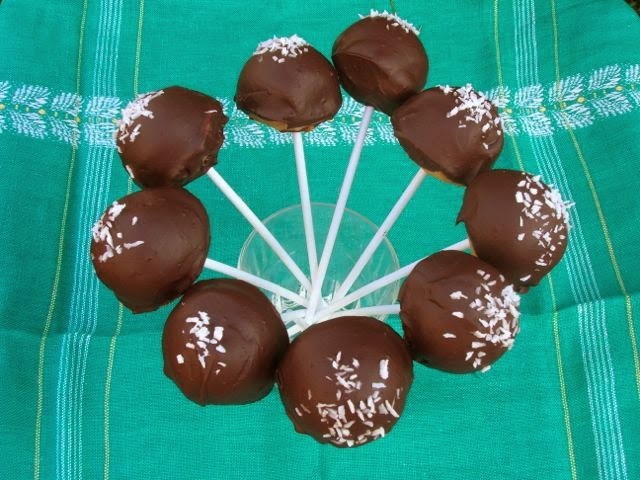 A lovely recipe, I’ve only made cake pops once and found them a little tricky, but no reason not to give them a go again and I love the addition of coconut and chocolate. Well it’s certainly true, they are not the easiest of bakes to make, but probably worth it for special occasions. These look so good and I love the idea of coconut and ginger with chocolate – scrummy! A great entry for this month’s Spice Trail ginger challenge. I do like cake pops and have made them a few times but they are a bit of a faff. Your silicon tray does look a little easier than my tin one though. And really like the new look for your blog too! Thanks Vanesther. I’m impressed you’ve made cake pops a few times. As you say, they are a bit of a faff, but they are also rather fun. The ginger and coconut was a really nice combination that I might not have tried if it hadn’t been for this kit. Never made a pop cake in my life, but if you make them next time we meet up, I would happily devour three or four of them! They do look lovely inside too. Very moist and gingery! Haha Karen – didn’t think I was ever going to either. Take it you didn’t get one in your bundle then? I found cake pops really quite stressful! I had difficulty in getting the balls the same size and shape as well as coating them… I had plenty of cake pop ‘heads’ falling into the chocolate. But they are amazing! I may have to invest in one of these moulds if I decide to make them again. Looks like you had great success! I must admit, I gave up on the perfect look quite quickly. I did have quite a problem with them staying on the sticks, some of them just slid down. I should probably try following the recipe exactly and see what happens then. Mine always fell of the sticks, so I gave up on them. Yes Jac, I had an issue of mine sliding down the sticks – rather frustrating. Coconut and Ginger in Cake Pop form has got to be good! Glad you got on with the set too, I haven’t used mine again since the Carrot Cake Pops but am planning on another session soon, my kids loved them! So much easier than I thought they would be. I stuck my Cake Pops on the sticks with melted choc which seemed to work a treat btw. Yours all looked splendid Lou and it’s such a fun thing for the kids to get involved in. Will have to try the melted chocolate trick next time, although I still don’t quite understand how that would help unless the chocolate hardens immediately. That sounds like a lovely thing to reminisce about. I’ve never had a really fresh coconut straight off a tree – I bet that’s good. Thank you CC – I tried to make them look good! Coconut, ginger and chocolate – how could these not be amazing! And they were Zed 😉 Thanks for commenting. Thanks Dannii – I guess you can feel virtuous about only having a small piece of cake rather than a whopping slice – if you can stop at one. The cake pops look beautiful. I think ginger goes so well with chocolate. Thanks Tina – I agree chocolate and ginger is a fabulous combination. Chocolate dipped crystallised ginger is one of my favourites. I’ve never seen the point of cake pops before either. However if you actually bake them as cake pops then I see the point! I didn’t realise there was such a thing as cocount sugar or flour. You’re always opening my eyes to new ingredients! Love the new blog layout and header by the way. Thanks for linking up with this month’s Love Cake. I’ve always been interested in healthy and usually whacky ingredients, so that’s why you’ll find plenty of them peppered around this blog. I’ve always secretly liked the idea of cake pops, but I don’t like making things just because they’re trendy, so I’ve held off. However, your point about the ratio of chocolate to cake might spur me to action. My issue with layer cakes is that there is never enough icing to go with all that cake! Ah well then, it does rather sound as if cake pops are for you – trend or no trend! And you would do them so beautifully too. I read this as I am down under, where cherry and coconut pairings are popular, also covered in chocolate. I bet ginger and coconut would give them a run for their money! These look so cute. These would make a super little gift for a chocolate loving friend.